Don't give me that side eye. You and I both know that you use Tinder, POF, or some other swipe a brother's face app. Either that or you deleted it. Being single again hasn't been an easy ride. When I was over the yeah-I'm-free aspect of it and back on the prowl, the natural way just seemed more difficult. When living in New York City, glances from strangers don't always end up in conversation and a smile. Or they do and your wallet is suddenly missing. 1) The location services are bull. This kind of reminds me of when Facebook reports that I'm in Brooklyn, when I'm really on the Lower East Side, but not really. One of those apps reported a brother to be 2 miles away, only to find out that he lived right across the street. Literally. I see him go into his car every morning now. (Funny how you don't notice some folks, until a shirtless picture points them out.) I know. He very well could've been two miles away, when I reached out to him. However, we're not going to use logic here. Thanks. My head is always in a book. When it's not...I'm a great conversationalist. Great cook, Cuban & Jamaican, goal oriented. I'm looking for a brother who's open & honest. Someone who understands that being yourself is everything, because everyone else is taken. No one under 25. I'm a rare breed, don't come at me if you aren't. If that intimidates you...run. If you don't know the difference between to, too, two, you're, your, they're, their, there, we're, were, and where........run, jump, dive, and drown. No more games. Go. Anyway...after posting this, my first message will be: Your so cute girl. Din, din? 4) Ghosts. *cues Chris Brown's "Loyal"* Um, if brothers don't get what they want...they disappear. No conversation, no honesty, just Casper. They also try to come back, after they realize you're the best thing since sliced bread. Thank you iPhone block, app block, and God-given avoidance. 5) First dates are always awkward. It's not just the general anxiety and awkwardness though. It's does-he-really-look-like-his-picture awkwardness. 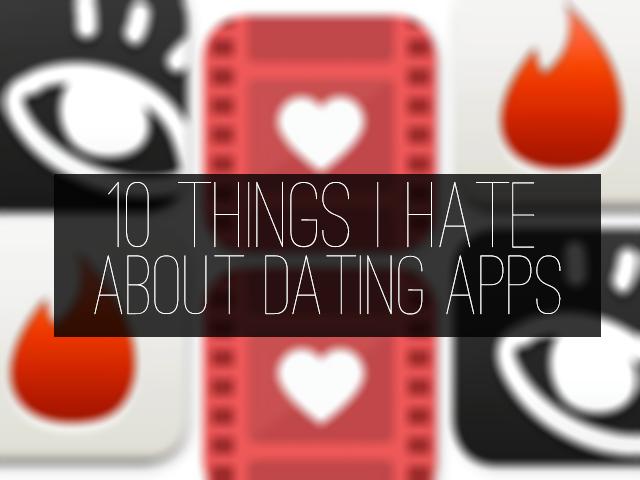 6) Some guys have been through way more than you, on dating apps. MESSAGE: Listen! I've been through a lot of games on this site! Don't tell me you're not interested too!!! ImmaculateOne: "I don't date black girls." ImTheOneYouLookingFo: "Hey Girl, I'm The One You Looking Fo." BetterThanYourAverage: "So...I know you've been dealing with a lot of wack dudes. I'm better." 8) They take up wayyyy too much space on your phone. iPhone: "You can't take a picture right now your storage is full." Mom: "You're getting old girl. Are you dating?" 9) If you and your friends use it and you live in the same area, you're probably meeting the same guys. "Girl his name is Jeremy, he lives in Union Square, he drives a...."
*rolls eyes* Again, DAMN YOU LOCATION SERVICES. Dating apps are here to stay. More and more people are looking for love online.